More than 40 days and 40 nights after it was revealed that what President Obama repeatedly promised wasn't true, at last count 52 million Americans will lose their health insurance, mainly because Barry apparently believes that when it comes to choice, he knows better. Based on the millions being unwillingly dropped from health insurance policies they chose and were perfectly happy with, Barack Obama must feel that Americans are incapable of choosing correctly. Not for nothing, but if the president is right, that conclusion casts a whole new perspective on his being elected twice. Irreparable damage on the national level aside, after hawking the Affordable Care Act like a snake oil salesman, barking "Step right up, if you like your insurance plan you can keep your insurance plan," some gravely ill Americans are finding out that the cure-all the merchant of "Hope and Change" peddled was pure quackery. Now, after a panicked realization has set in, the president, doing what he does best, decided he should at least make believe that he's sorry and that he's diligently working toward rectifying the catastrophic situation he caused. Appearing remarkably serene, Obama chose to share his remorse with NBC anchor Chuck Todd. In an on-air interview the president said that he was sorry about people with cancer who, because they can't afford the Obamacare premium, have decided to "let nature take its course." Feigning regret, the president acknowledged that people like Edie Littlefield Sundby, a woman with Stage IV gallbladder cancer who was dropped from her insurance, are "finding themselves in this situation based on assurances they got from me." After talking about how "we didn't do a good enough job" in crafting the law (note the use of "we" instead of "I"), and unable to fall back on his usual scapegoat, G.W. Bush, the president, who modifies everything he says after he says it, first put the onus on evil insurers being responsible for modifying their plans after the law was passed. Moving the conversation along, the president, who is gaining the reputation for being a liar around the world, said that "we" are doing "everything we can to get it fixed," and that "we" are "looking at a range of options." A "range of options" to do what, compensate for the disastrous results of three years' worth of the president's blatant lies? And although it's too little, too late, Obama's on-camera façade of contrition was, at best, mildly amusing. Then, predictably shifting into full-blown victim status, Barack Obama came out with something downright stunning. Having lost his head for a moment, the Barack Obama we all know and recognize emerged when he bemoaned his having "been burned ...[by] a website." Whoa! After spending three years actively conning the country into buying a product he knew the whole time was bogus, and after millions of insured Americans laid aside their cynicism only to find themselves without healthcare coverage, blame-meister Barack 'Hey, Don't Look at Me, I Didn't Do It' Obama now dares to say that a poorly-planned healthcare rollout burned him? Yes! 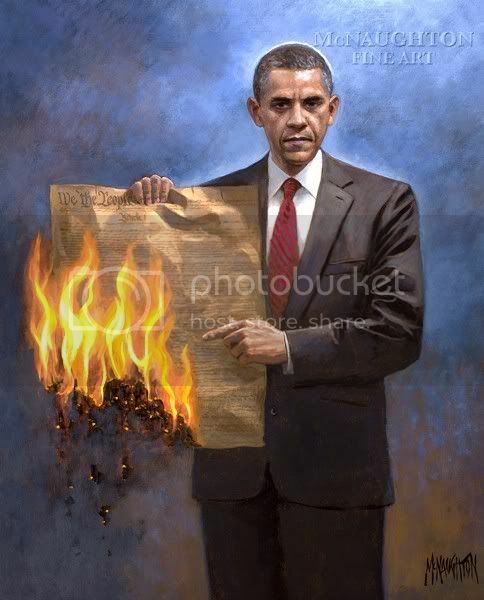 Constitutional arsonist Barack Obama, the man who advocates the saline-scalding of unborn babies, the person who regularly blowtorches the First and Second Amendments, ignites racial unrest, has turned the economy into burnt toast, inflamed relations with America's allies, and set afire just about everything America holds near and dear, actually had the effrontery to utter the words "I've been burned." The only thing missing from the interview was Barack Obama having to have his smoldering pants be doused with a fire extinguisher.